This is Aunt Grace from Aunt Grace’s Stay ‘N Play. Our stone, fully furnished, air conditioned cabins are easy to find on Hwy 178 in Lakeview. We are centrally located to many of the areas attractions. (caves, theater, antiques, dam tours, horse back riding, fishing etc. )Wonderful curving roads, 2 lane lightly traveled. There are 2 great restaurants within walking distance. If you like to cook we have grills and full kitchens. For your convenience we have FREE wireless access. WI-FI. Pool has a covered deck. Shaded Picnic area for you to relax, grill or just sit on the wooden swing and reflect. We do not have a guide service at our resort which leaves you free to use an independent guide and then go out on your own without any pressure. One day with a guide is a wonderful idea, as then you will learn the “tricks” of fishing these waters, lake or river. I can suggest some guides. We are just minutes from the watercraft & boat slip rentals. I would like to say Thank you for a fabulous stay. Such wonderful location and settings. I and my fellow Eagle members really enjoyed your hospitality and look forward to visiting you again. This saves over $20 a night. God Bless all you positive ladies. Special for readers of this site. I would like to add a $49 a night special for up to 4 people from Dec. 2010 to April 2011. All the person/rider has to say when they book is that they saw the special on your site. May to Oct. I would offer 10% savings to your readers. This is for aunt Grace's Stay n Play resort in Lakeview. I didn't ride in on a motorcycle, but really enjoyed my stay. The cabins are beautiful & the hostesses are wonderful people. Their suggestions for places to eat were excellent. All meals were delicious. My friends and I only spent a few day at Aunt Grace's but we should have made it longer. This is a wonderful area to ride in. You're close to the lake and the river. You don''t need a boat to go swimming in the lake. They have nice swimming areas near by. The cabins are sooooo comfortable. You even get popcorn delivered to your room and I got one of the best massages that I have ever had right at the resort. We elected not to cook and took advantage of some of Aunt Grace's suggestions. We even had some of the best pizza delivered to our room from Bush's Pizza. We sat by the pool and ate wonderful pizza. I highly recommend this resort to everyone to try. Join in and write your own page! It's easy to do. How? 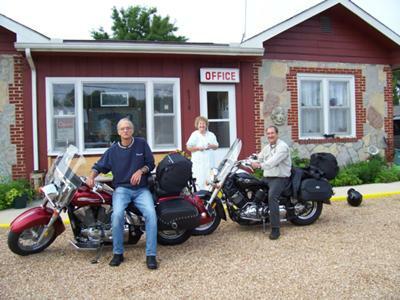 Simply click here to return to motorcycle-friendly hotel,business.